Association Adikia put up their web site just last month, although some of the members have had a Facebook presence for some time. Last week Le Monde published a letter from key organizers explaining who they are, what the problem is, and what they plan to do. We are wrongly accused of abusing our children as a result of misdiagnosis”In a tribune in “Le Monde”, a hundred parents testify to their fight, accused of violence on their children while they are suffering from a rare disease. They created the Adikia association to advance their cause to justice. We are more than a hundred parents wrongly accused of abusing our own children as a result of misdiagnosis. Two and a half years ago, one of us created a Facebook group to tell her story. This is where we found ourselves over the months after experiencing the same dramatic situation. While we consult pediatric emergencies for our babies who are uncomfortable, doctors detect signs a priori suggestive of abuse. These are mainly fractures, bruises, or bleeding inside the skull and eyes (subdural hematomas and retinal hemorrhages). These last two signs are typical of the “shaken baby syndrome”. In our case, however, our children have various rare diseases. For example, the son of Virginie (creator of the group) is suffering from hypofibrinogenemia, a rare genetic abnormality of blood coagulation. As indicated by the report of the High Authority of Health on the subject, disorders of coagulation form an important class of differential diagnoses of shaken baby syndrome. The son of Vanessa (president of the association) is one of the many babies in our association with external hydrocephalus. Clinical studies suggest that this pathology may favor the occurrence of subdural haematomas. Marielle’s daughter has osteogenesis imperfecta, or glass bone disease, which can cause fractures. Emi has hypophosphatasia and her son has bone fragility associated with vitamin D deficiency. In an emergency, however, doctors must diagnose quickly and act if they feel the child is at risk in their family. They make a report, which leads to the almost automatic placement of our children. They are withdrawn while we are taken into custody and questioned by the police. As if dealing with the suffering of our babies was not enough, we must also suffer unjustified accusations of abuse. Worse, we must live with the idea that our babies will have to spend the next months or years away from us, when they are sick and need all our love. Their first steps, their first laughs are stolen forever. Strong emotional ties with parents are essential for the neuropsychological development of babies, as pediatrician Catherine Gueguen has shown. We have all had suicidal thoughts, but we must absolutely stand firm for our children. The placements end when the juvenile judges finally feel that we are not dangerous. In a way that is difficult to understand, we are criminally prosecuted when the judicial expertises are carried out. Specialized maltreatment doctors seem to validate the violence systematically, even in the presence of rare and unknown diseases. We have a hard time getting specialists in rare diseases to do their own expertise, even more when the medical records of our children are seized by the courts! The example of the little Luqman is characteristic. At 16 months, he spent 13 away from his parents. More than a year ago, he had hemorrhaging leading to a diagnosis of shaken baby syndrome. An extremely severe vitamin K deficiency (necessary for blood clotting) was quickly detected. It appeared later that Luqman had abetalipoproteinemia, a rare genetic disease that could cause such a deficit. According to several doctors, this disease could explain the symptoms. Today, Luqman is still placed, and his parents are indicted. For the legal experts who have access to the whole file, the signs presented are characteristic of shaken baby syndrome and the diagnosis of abuse is therefore certain. Can we really be certain that this disease, which affects less than one in a million babies, can not cause subdural haematomas and retinal hemorrhages? We have trouble making it clear to the various speakers that the words of doctors and experts never have absolute truth. We must all show the greatest humility before the complexity of the human body. We do not know everything about medicine, far from it. We have created our association – Adikia – to support and inform those unfairly accused, to make our testimonies known to the public, and to gain more weight in court. We would like doctors to take every precaution, as far as possible, and for the judges to consider all the elements of the files. Decisions as serious as long-term placements or prison sentences must not be made solely on the basis of medical evidence, however clear and categorical. We would also like to be involved in improving the reporting and diagnosis criteria for suspicion of abuse. Our goal is to avoid unfounded accusations and unjustified placements as much as possible while respecting the sound and indispensable principle of child protection. Virginie Skibinski and Vanessa Keryhuel, for the Adikia association. Association Adikia had already reached out to other parents’ organizations, including Protecting Innocent Families in the U.S., which now shares the logo created for them all by Italian artist Chiara Zini. For more of Zini’s work, see the beautiful and touching site una Mamma, un Papá. If you are not familiar with the debate about shaken baby syndrome, please see the home page of this web site. In another small step forward, a father in Michigan has been found not guilty of murder or abuse in the death of his 11-week-old son, after spending 16 months in jail waiting for trial. Mark Hontz had reported falling down the basement stairs with the boy in his arms, landing on the infant when they reached the floor. Doctors at the University of Michigan, however, rejected that explanation for the child’s injuries. At the preliminary hearing, forensic pathologist Dr. Jeffrey Jentzen pointed to anterior rib fractures and neck damage, which he said were “more consistent” with the compression and whiplash that occur during squeezing and shaking than with a fall down stairs. In the journal Pediatrics in 1988, Drs. 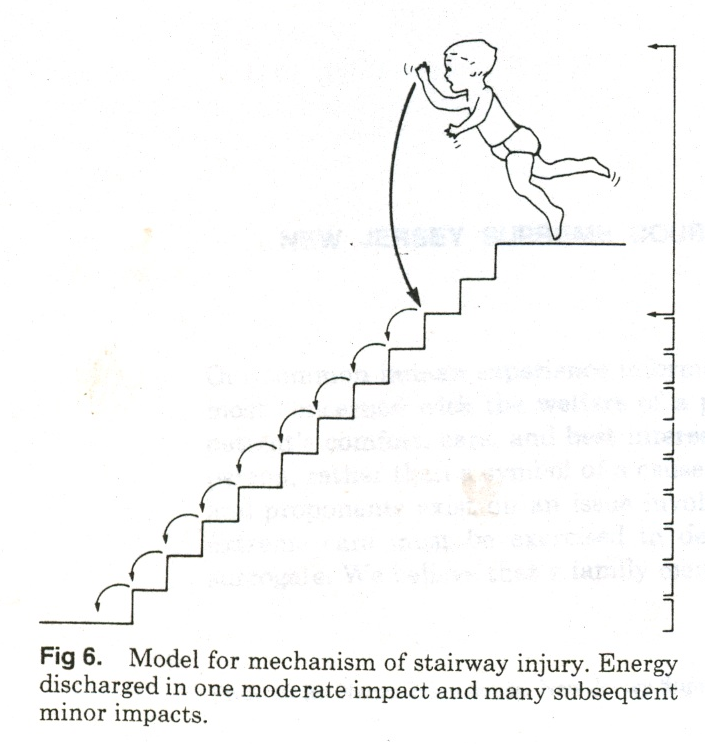 Mark Joffe and Stephen Ludwig at the University of Pennsylvania proposed that model in their paper “Stairway Injuries in Children,” illustrating their point with the figure to the right. That paper had concluded that “nonaccidental injury should be suspected” when children receive serious injuries in an alleged stairway fall. The photos at the top of this page show the stairs to Mark Hontz’s basement, with the figure at the starting and landing spots he reported. A biomechanical engineer brought in by the defense pointed out that an adult falling forward down stairs does not fall one step at a time, as the feet are no longer under the center of mass. Instead, the body falls forward, propelled by the force of gravity, until the motion “is arrested by contact with the ground or steps.” The engineer calculated that the infant experienced a vertical fall of 9 feet, landing with an approximate speed of 16 miles per hour. Investigators conducted a series of interviews with Mark Hontz, finally confronting him with the medical opinion that his son did not die from a fall down the stairs. “Hontz offered no other explanation,” the police report says, which is another way of saying that, even under intense pressure during repeated interrogations, the father never changed his story. Illustrating the value of a thorough defense, attorney Sharon Clark Woodside also called in a forensic pathologist, a child abuse pediatrician, and a pediatric radiologist to rebut the prosecution theory. Two witnessed shakings in separate hemispheres this winter seem to have produced no injuries, nor any questioning of shaking theory. Dismayed diners at an Australian cafe called authorities about a man shouting and shaking his 5-month-old daughter, according to a news story by reporter Allison Harding. After paramedics checked the child and cleared the father to take her home, Harding wrote, other patrons attempted unsuccessfully to block his car. The father later pled guilty to unlawful assault and has sought treatment for “long-term mental health issues.” His wife reportedly stood by him in court, calling him a responsible and loving father. Concerned bystanders in Cottonwood, Arizona, called police and recorded video of a 19-year-old mother shaking and slapping her 10-month-old daughter at a street corner, according to coverage in the Verde Independent. Responding officers arrested the mother, a transient already known to local police and described as “combative.” Authorities later discovered that the child was missing from foster care in another state, kidnapped by her parents during a family visit. The Independent’s coverage quoted Cottonwood Police Sergeant Tod Moore, who said, “I have seen too often in shaken baby cases where permanent brain damage or death occurs. We appear to be very fortunate this time.” I note that Sgt. Moore has probably seen serious injury in cases where the doctors diagnosed shaking. In the one witnessed case he’s probably handled, doctors at the local hospital found no injuries. Convictions of and accusations against fathers continue to pass through the headlines. Using a computerized animation, Esernio-Jenssen demonstrated how, she said, a baby’s brain would hemorrhage from being snapped back and forth in the hands of an angry adult. [Dr. Esernio-Jenssen] testified the baby would have shown immediate symptoms following the “severe, lethal episode of head trauma” she suffered, meaning the injuries occurred while [the father] was alone with the child. Depressingly, the father’s defense attorney seems to have focused on blaming the child’s mother, arguing only that the injury had been inflicted before the girl was left in his client’s care. The story of a young father accused in Wisconsin, meanwhile, received mixed coverage in a single treatment, with a headline about possible doubts but six opening paragraphs focused on the prosecution theory of shaken baby syndrome—the unfolding article then cites the Audrey Edmunds case and reveals that the defense attorney is fighting hard against the diagnosis. And in Florida, investigators have reached the improbable conclusion that a 43-year-old mother and foster parent—active in the local child protection community—became enraged enough to batter a 17-month-old to death in the 7-minute gap between the time a social worker left her home and the time she dialed 911 for help with an unconscious toddler. Coverage in the Tampa Bay Times describes a boy with a complex medical history, including developmental delays and physical signs of early neglect. The child used a feeding tube, and he had been discharged from the hospital just a few hours before his collapse, after three days of treatment following a choking incident. Faith in the diagnosis of abusive head trauma, with a guarantee of immediate symptoms, apparently overrides the logical assessment of established medical facts. This story reminds me of Quentin Stone in California, a father acquitted in 2014 by jurors in Yolo County who accepted that the child’s fatal collapse had resulted from an evolving head injury suffered in an accidental fall. Stone had taken his son to the hospital several months before his medical crisis, just to make sure he was OK, he said, after the boy had rolled off a bed. Doctors found no injuries and released him, but over the following weeks, the Stones had sought medical advice repeatedly for their son’s ongoing vomiting and apparent “breath holding.” Despite that well documented history, the prosecution charged Stone with murder after the boy’s fatal collapse, based on medical opinion that the brain findings proved abuse and the symptoms would have been immediate. Also in Yolo County, a public invitation this winter to the annual Rotary Club of Davis fund-raising dinner noted that a team of Rotarians had taken a trip three years ago to Kenya, East Africa, “to educate physicians, medical students and nurses on how to identify abusive head trauma in children.” The article did not say where the Rotarians got their own medical training, but it reported that the team “trained nearly 1,200 professionals throughout Kenya.” According to the shaken baby page on the web site for Rotary District 5160 (northern California), the Davis chapter also provides shaken baby simulator dolls to schools and hospitals. Knowing they had not abused their son, Ally says, she and the child’s father started looking for another doctor who could give them an accurate diagnosis. They found Dr. David Ayoub, a pediatric radiologist in Illinois who determined that the infant suffered from rickets, a lack of mineralization in the bones that predisposes to fractures. Once considered a disease of the past, rickets remains “a significant cause of nutritional disease for infants,” according to the American Academy of Pediatrics. The family’s second child was removed from them at birth because of the pending charges. While they wait for their case to work its way through dependency court, Ally and her partner can see their sons only for a few hours at a time during scheduled visitations. If you are not familiar with the debate about shaken baby syndrome/abusive head trauma, please see the home page of this site.